I had finished at total of 6380 stitches and 27 rows of my SECOND try of Sandrilene. I finally had the right gauge, using a single needle size throughout. Look at these perfect, lovely, photo-worthy stitches. And yet, something was nudging my lizard brain, something that kept hinting that I might just possibly maybe might want to put the thing on some waste yarn and have a little try-on check with reality. But I’m a knitter. We knitters hate to do anything other than knitknitknit. We don’t want to put our needles down to feed our children, why would we want to put them down to try something on? (The horror.) One reason folks love top-down knitting on long circs so much is that “you can try it on as you go!” which really means that the time it takes to pop it over your head and assess the damage is minimized, so that you can be back to knitknitknitting before anyone’s really noticed the lack of needle clicking. The truth is, you can try on bottom-up garments. It’s just more awkward, and perhaps maddeningly slow if the sweater is pieced. But Sandrilene is knit in one piece from the hem up, and I had two long circs on which to spread out the stitches, so I really had no excuse. Factoid #1: Sandrilene is not an overlappy sort of cardigan. It’s supposed to have a wee gap in the center, or possibly just touch edges. Factoid #2: That there, my friends, is an overlap of about 4 inches. Give or take. Factoid #3: I am not really stretching the fabric. Notice the stitches? They are still pretty much in a relaxed state. Factoid #4: That bit of cardi is being tried on over a pair of jeans. The jeans are secured with a bulky belt. The cardi is wrapped over both belt and jeans. Factoid #5: This means this incarnation of Sandrilene is helluva too big. By about 5 inches around, unstretched. Let us pause for a moment whilst I remind you what I do for a living. I teach knitters how to knit sweaters that fit. My classes are full of gauge-swatch this, and measure-yourself that, and math-is-easy the other thing. Folks love my classes, they send me photos months later of themselves in lovely, well-fitting sweaters that they proudly wear about town. My Sandrilene (Sandrilene Take Two, I might remind the studio audience) is at least Five Inches Two Big, even with all sorts of math and measuring tape kung fu. Jiminy Christmas Bells, Charlie Brown. I spent a fair bit of time measuring, doing gauge checks, analyzing the schematic, doing stitch counts, blah blah blah. Had I lost weight? 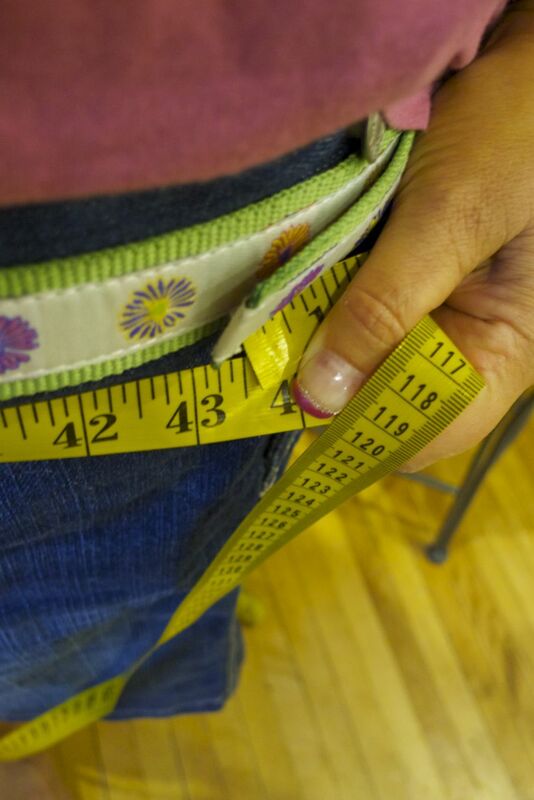 That seemed to be part of the problem, seeing as I thought my hips were 46″ (last time I measured they were, anyways) and they had sneakily backed down to 43.5″ (0ver jeans + belt) when I wasn’t looking. Maybe I had mis-calculated the ease. Whatever. In the end, I realized that I didn’t need a cute rocket scientist with a mohawk to tell me the answer: The damn thing was too big, and I had to make it smaller. I had my measurements, I had my gauge, I could multiply as well as any fourth-grader, and so I just tossed out all the fancy-schmancy rational analysis and dealt with Reality. Sweater too big. Too big = Too Many Stitches. Take away stitches, make sweater smaller. I want sweater to be X smaller, so take away Y sts. One would think she would feel confident with a zillion measurements and the skill of her hands, no? I rather think the results were worth a round-trip plane ticket to Walla Walla, don’t you? So, if Emmy-award-winning garment makers think that they ought to do a fitting for a custom garment, why do we knitters think we can cast on, knit an entire thingie, and just by-golly end up with something that fits? Just because the pattern says so? Just because the schematic looks right? Just because our gauge matches? Lesson learned for me: There is no substitute for a little try-on session, followed by some common-sense math. The results of my try-on sweater session are as follows. A cuddly baby animal. An orphaned cuddly baby animal. Awwwww…. I liked this article on what to do with Failure. Lego gets warped: A working loom created out of those little colourful bricks we all adore. If you’re not into looms, how about a seven-foot model of the Serenity? If you don’t know what the Serenity is, a treat awaits you. Take the afternoon off, go here and watch that. After you’re done there, start with this. And if neither loom nor spaceships get you excited, what about a custom Lego portrait? And one more inspiration: Origami artworks. Like street graffiti. Only…not. 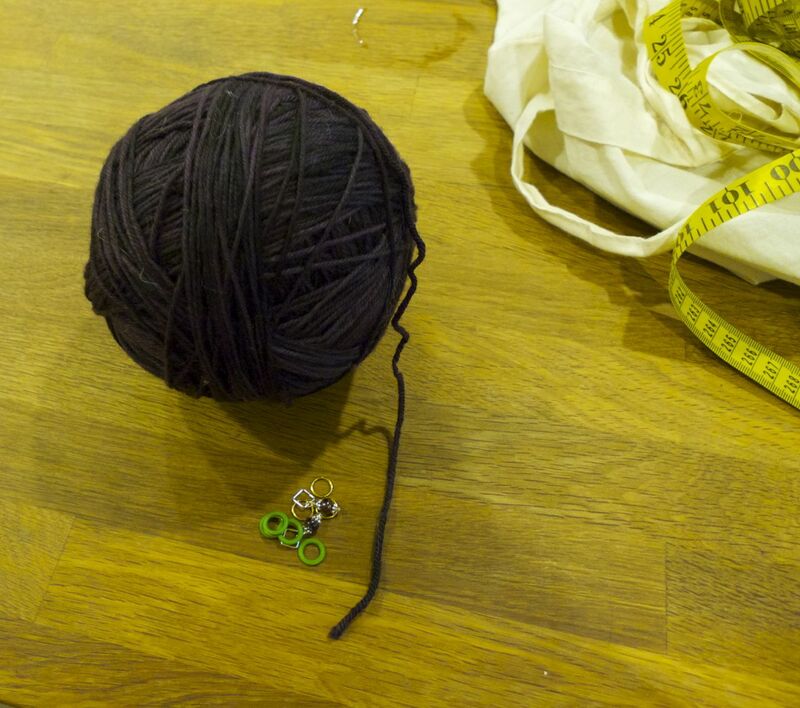 I’m off to wrangle some beads and have a chat with that ball of yarn pictured above. It’ll be a good chat. Maybe I’ll even get a sweater out of it eventually. 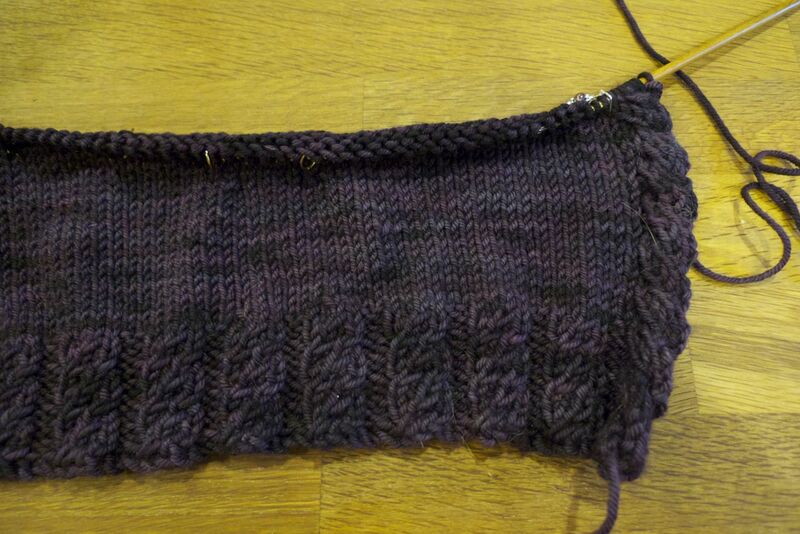 This entry was posted in Uncategorized and tagged Failure, Knitting, Ravellenics 2012, Sandrilene. Bookmark the permalink. Sandi, that is NOT failure. Ripping and reknitting is (a) smart because you are beautiful and deserve a sweater that fits; (b) smart because you get to flex your big beautiful brain-muscles and keep them fit; (c) smart economically because you get so much more entertainment time for the price of your artisanal yarn; and (d) smart because you get the pleasure of knitting with said artisanal yarn for longer than the yardage might otherwise have allowed. At least, this is what I tell myself any time my own knitting plans get derailed! i agree with annie bee – this is definitely not a failure. besides, now i (and i’m sure quite a number of other readers!) feel much better about sending a couple of projects i had been feeling ‘iffy’ about to the frog pond…..if it can happen to you, i feel ok with it happening to me! 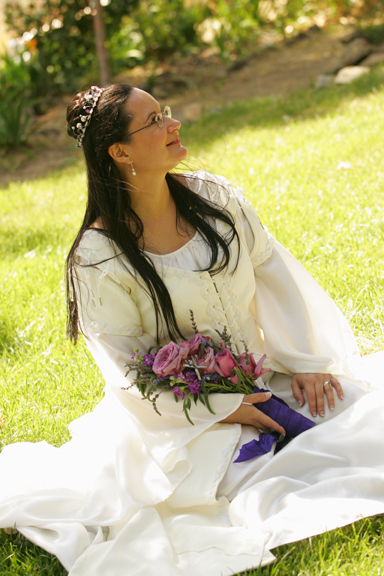 Whoa, your wedding dress was steampunk waaaay before the word ‘steampunk’ was even coined! But why am I not surprised? 🙂 Beautiful. I also LOVE your wedding dress – what a beautiful bride. I don’t suppose you have any detail shots to share. You were a BEAUTIFUL bride. Wow… I’d say well worth it! beautiful dress, beautiful bride (and of course a tiara!) and snuggly cuddly walrus baby!!!!!!!!!! Beautiful dress for a beautiful lady!!! I am also reknitting a sweater that was too big so I can relate! You are an inspiration to me because you are such a great knitter. I mess up all of the time, so rather than get angry with myself and not knit I will try to have the same good attitude you have. You looked pretty in your dress. I actually like futzing with the fit of my sweaters, even after they’re done. I will prevail! I want the sweater to look good on me! Non-fitting garments are not failure, at least not to me. I managed to knit a pair of socks in two different sizes, with the same pattern, the same needles, the same stitch count, the same gauge(!). I never found out why one sock fit perfectly and the other one was about an inch too wide… the mysteries of sock knitting. nope, you failed. (failure article is a must read) Or mebbe you suffered from a bout of “swatch perfectionism”, i.e., you [i.e., me] become possessed by some nun-pleasing idiot who hits gauge perfectly and once that’s over, relaxes and gets in the zone. 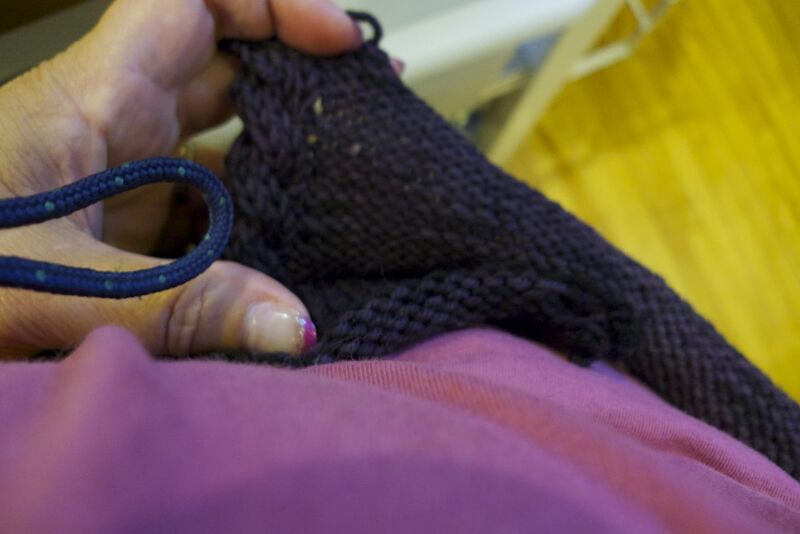 Only to discover that swatch and finished knitting have not even a nodding acquaintance as far as gauge goes…ever notice how sometimes a sweater will actually be different sizes on opposite sides? I agree with yasmin on her conclusion “…where the cause is never to be found.” And in the immortal words of a cartoon character: OH NO! Not another learning experience. Yarn is gorgeous! Sweater will be fabulous! Cast on! And measure, measure, measure. And wedding dress? I think you should get married again. Or maybe every year. Dress [and bride] are stunning. I love the walrus! It makes me want to pull out my large stuffies (which way tons less than baby walrus) and surround myself with them. Ah Sandi, my friend. The problem with the pie approach to ripping and mathematics is that whatever math you do is going to be dead wrong by tomorrow morning. No. If you must rip, remeasure, remultiply etc, be absolutely certain to do so with carrot sticks!